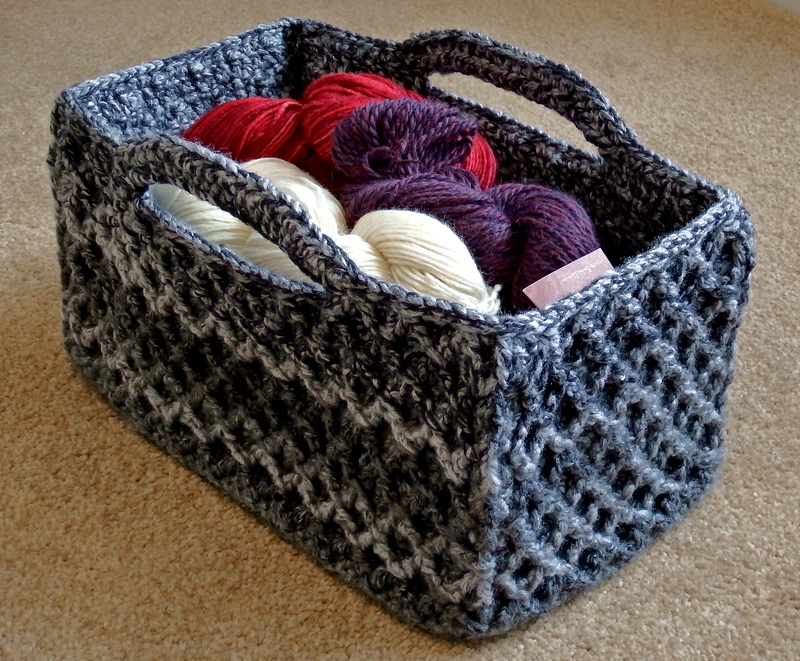 Rectangular Diamond Trellis Basket – Free customisable crochet pattern with video stitch tutorial! 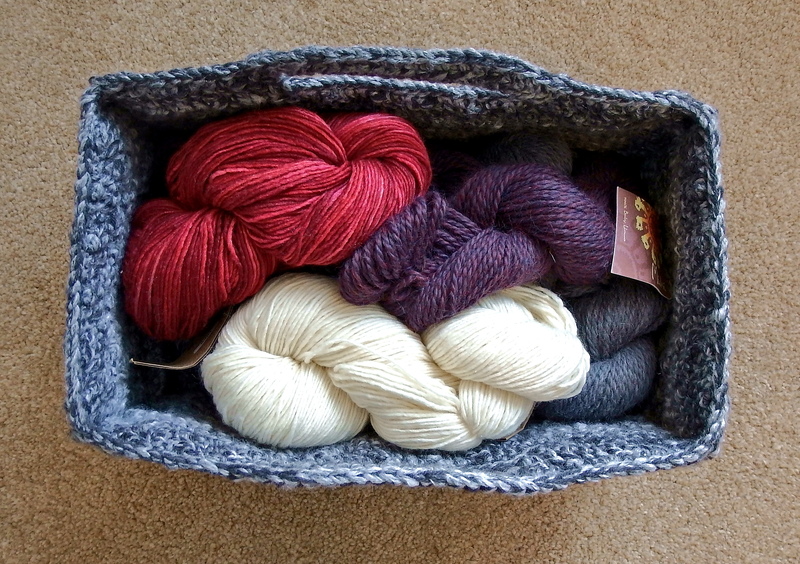 More stash busting yarn storage! I know one of the reasons my customisable rope basket has been popular is because of it’s rectangular shape. So I thought I’d expand on my patterns using the diamond trellis stitch and make a rectangular version of this round one! This rectangular version is also customisable – just do an even number of rounds for the base and then move on to the sides. So you can make whatever size you like! Mine is 34cm by 24cm by 18cm high. I used 264g (450m) aran weight yarn and 158g (490m) dk yarn held together, with a size 5mm hook. 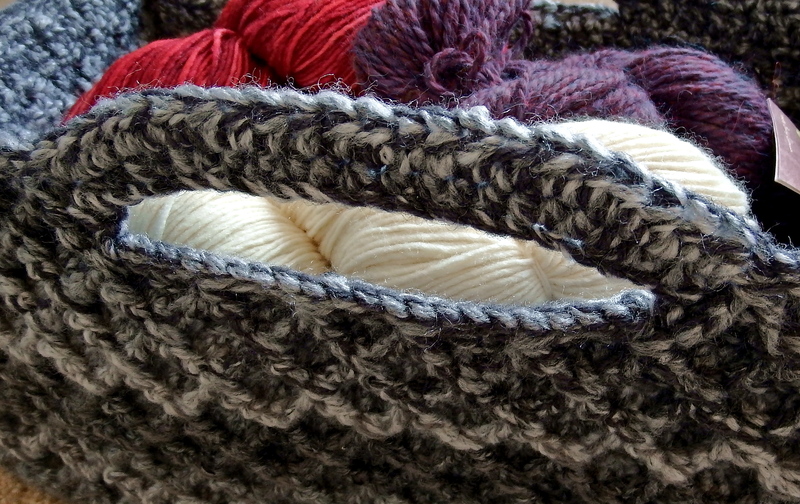 You can use any combination of stash yarns held together to make a super chunky weight equivalent yarn. Choose a hook size as small as you can still crochet with smoothly so that the resulting fabric is stiff. Cut two 40cm lengths of all the yarns you are holding together before your begin– this will be used to crochet the edging sl-st onto the handle area. You will find 4 stitch markers placed at the corners useful for this project. The basket is crocheted in the round from the centre out and then up to make the sides. I turn the work at the end of every round. If you prefer you can crochet a rectangular base in your preferred method and then crochet evenly around it before starting the sides. You will need to end up with a multiple of 4 plus one corner stitch on each side for the pattern to work. Join the yarn to a corner stitch to start the sides. To adjust the pattern to your preferred dimensions, begin with a chain which is a multiple of 4 and is the length of the difference in side length – for example to make a 10cm by 15cm basket, make a chain which is 5cm long. Then add or subtract a few chains to make it a multiple of 4 chains. My basket started with a chain which was 20 chains (10cm long). When you are working the diamond trellis stitch for the sides you may find this tutorial video useful. Please try making this quick swatch before you make the sides of the basket if you are unfamiliar with this stitch! Yarn over hook and draw up a loop (4 loops on hook). *Yarn over hook, draw through 2 loops, repeat from *, 2 loops left on hook (one arm of the V made). Yarn over hook twice, skip 3 sc posts, insert hook horizontally behind the next post. Yarn over hook and draw up a loop (5 loops on hook). *Yarn over hook, draw through 2 loops, repeat from *, 3 loops left on hook. Yarn over hook, draw through all three loops. The remaining fptrc2tog stitches of the first row using the stitch are worked the same way – with the first arm of the V worked around the same post as the last arm of the previous stitch. After the first row using this stitch the fptrc2tog stitch is worked around the top of the previous fptr2tog stitches rather than the sc posts. Ch1 at the start of a round does not count as a st. Ch2 at the start of a round counts as an hdc or dc stitch. R1: ch2, (hdc) in the 2nd ch from hook. (You may wish to mark the first hdc with a st marker) hdc in each ch until 1 ch remains. Work (6hdc) into the final chain – the 2nd and 5th hdc of this group are corner sts – you may wish to add a st marker. Hdc back along the other side of the ch working one stitch into each chain unti the final ch (this already has 2hdc worked into it from the start of the round). Work (4hdc) into the final ch. The second hdc worked of these four is the final corner stitch – you may want to add a marker. Sl-st to join. Remaining rounds work one hdc into each st and 3 hdc into each corner st, turning each round. R2: ch2, turn, hdc in same st, hdc, hdc, (3hdc) into corner st, hdc in each st until next corner st, (3hdc), hdc, hdc, (3hdc) into corner st, hdc in each st until final corner st,hdc and join with a sl-st into starting chain. For the remaining rounds work one hdc into each st and 3 hdc into each corner st, turning each round. Work an even multiple of rounds until the base is your desired dimension. This will give you a multiple of 4 stitches on all sides, plus the corner stitches. Example shown used 12 rounds for a 34cm by 24cm base size. Work R1 in the back loop only to make a ridge around the corner of the base. Work R1 in the clockwise direction and the base is placed with its base downwards. R1: ch1, sc into each stitch around, join with a sl-st.
R2: ch2 (or 3 if you prefer), turn, dc into each st around, join with a sl-st.
R3: ch1, [work a fptrc about the post of the corner st directly below (to make a vertical stitch). Sc in next st, frptrc2tog (work the first arm about the post of the sc just used for the corner fp stitch, and the second arm about the sc post 4 places along from this – so that there is a space of 3 sc unused). *Sc in each of the next 3 sts, fptrc2tog, repeat from * until only 2 sts remain before the corner stitch, sc in each of the final 2 sts.] Repeat everything between  for the final 3 sides, join with a sl-st.
R5: ch1, [work a fptrc2tog, but about the post of the vertical fptrc st directly below (to make a vertical stitch) and then with the second arm about the top of the next fptrc2tog st (to make a forward sloping arm). Sc in next st 3 sts, frptrc2tog (with the first arm about the top of the fptrc2tog just worked about, and the the second arm about the next fptrc2tog st). *Sc in each of the next 3 sts, fptrc2tog, repeat from * until only 4 sts remain before the corner stitch, sc in each of the next 3 sts, fptrc (a backwards sloping stitch about the last frptrc2tog st just worked about).] Repeat everything between  for the final 3 sides, join with a sl-st.
R7: Work as for round 3, but work the post stitches about the existing fptrc2tog sts rather than any sc posts. Repeat rounds 4-7 until the basket is a round less than your desired height, ending on an odd round. Example shown uses 17 rounds. Do not fasten off, but find the lengths of yarn cut before you started as we will now join these to make the edge for the handle. Handle detail from Rectangular Diamond Trellis Basket – Free customisable crochet pattern with video stitch tutorial! Join the yarn on the side where you wish to place the handle. I used 5 pattern repeats centred on the long sides – if you have worked two rows more or less than the example you may find 4 pattern repeats is centred correctly instead. Join the yarn one stitch further on from a fptrc2tog st into the back loop only and to work counter clockwise. Sl-st into the back loop only for 19 sts (or 15 sts if you are working the handle over 4 pattern repeats). You should finish one st before a fptrc2tog st.
Repeat for the second handle using the second lengths of yarn. Now pick up the main yarn and continue working in pattern until the handle area. R8: ch2, turn, *dc in each st until you reach a place where you have edged the handle hole. You should have just worked a dc into a fptrc2st. Ch 19 (or 15 for a 4-pattern repeat handle whole), dc in next unworked st (this will be another fptrc2tog stitch). Repeat from *, dc into all the remaining sts and join with a sl-st.
R9: Work in pattern (i.e. either a round 5 or 7 depending on which is next) until you reach 1 st before a handle chain. *Hdc2tog (last st on side of basket and into the 1st chain for the handle), hdc2tog (over next 2 chains), (2hdc) into next chain, (2hdc) into next ch, hdc in each chain until only 5 chains remain, (2hdc) into next chain, (2hdc) into next ch, hdc2tog (over next 2 chains), hdc2tog (last ch and 1st st on main body of basket)*, continue to work the main basket pattern until you reach one st before the next handle chain. Repeat from * to *, continue in main pattern to the end of the round and join with a sl-st.
R10: ch1, turn, *sl-st in the back loop of each st around until you reach an hdc st from the round below. Hdc in every hdc st, repeat from *, sl-st in back loop of every remaining st, join with a sl-st.
Fasten off and weave in ends. Do not block! So, what will you be storing in yours? Rectangular Diamond Trellis Basket – Free crochet pattern with video tutorial! Someone shared this on Facebook today and I love it. After reading the pattern, I am truly impressed with your work! I am now a new reader! I loved that rope basket too! I look forward to more. Thanks Amanda! What a lovely comment :). I hope you like making it too! Thanks so much for sharing this pattern. I love that it fulfills my “I demand form AND function” criteria. Once I’ve made one successfully (just getting started at playing with post stitches) I’ll try to make it taller as a laundry hamper. Thanks again for being so generous with your knowledge! Hi Maribelle! Thanks for your comments! I love the laundry hamper idea! I think you may need to make the base heavier for stability if you make it very tall. Unless like my laundry hamper, it always has laundry to do in it! I’ve been looking for a stiff basket pattern. Thanks for sharing I love it. I can’t wait to try it for myself. I am a little confused. In just reading the pattern (I haven’t begun work yet), it says when working on the Sides on Round 3 and Round 5 (Or is it Row 3 and Row 5? ), it says to repeat from the *. I don’t see another *. Where am I supposed to repeat from? This looks like a beautiful basket and I’d love to make some of them. I just need a little clarification. Sorry about that! I have added them in now. Let me know if you have any more problems! I really love this pattern! I made the round one but wanted to do a rectangle one too although I’m having some problems with the bottom. I have never done anything square/rectangle in the round. I was wondering if you would consider doing a video tutorial on just the bottom? Even if it’s only 2 or 3 rounds it would be extremely helpful! Thank you!!! Hi Mattie, I’m glad you like this! I’m not planning on doing a tutorial on this, but here are my tips: Use a stitch marker in each corner stitch – it makes it a lot easier even if it seems unnecessary at first, and also, try turning your work every round (if your stitches tend to slat a little, like mine do, then you’ll end up with a parallelogram rather than a rectangle if you don’t turn!). Failing that, make the base in rows and then edge it all the way around with the right number of stitches. No one can see the base when it’s in use anyway! Hi, as I’m reading through the pattern, it seems to me that since you are working the base in rounds, when finish the base you will be in the middle of a short side (as opposed to a corner). Don’t you need to start the hdc rows and diamond pattern from a corner? Or am I missing something? Thanks! I LOVE this basket and can’t wait to make it! Hi, I love this pattern! I noticed you have a different color yarn for a couple of the diamond pattern rows. Can you tell me how you did this? I like the look of a little contrast. Love this pattern & can’t wait to get started but I notice you say to NOT block it . . . wouldn’t that make it stronger/stiffer? Great question Jayne! Usually blocking softens the fibres adding drape. But if you make this in pure wool or with a high wool mix fibre then light blocking could felt the fibres slightly adding some stiffness. So I guess it depends on what you used to make it. Generally though I would say if you’re happy with it before blocking then leave it alone! I found this basket on allfreecrochet but did not down load it. Then was on Ravelry and saw it again. I have it downloaded on my phone and Samsung tablet. I love this basket. I am making on to hold my crochet progets i am working on. I love this annd your rope basket pattern. Thank you. Hi I love your work – I have only recently stumbled over your patterns thanks to Pinterest – I’m wondering – do you think this pattern will work if I use multiple DK strands? If yes – how many would you suggest – 3 or 4? I am trying to find the crochet pattern for the shawl recuerdos de infancia which I found on pinterest. I hope you will be able to send it to me. Hi Cheryl – I’m afraid I have not heard of this pattern. Why don’t you try doing a google image search? Hi Jen – sorry but there is no chart for this! Reblogged this on strikkepinner og heklekrok. 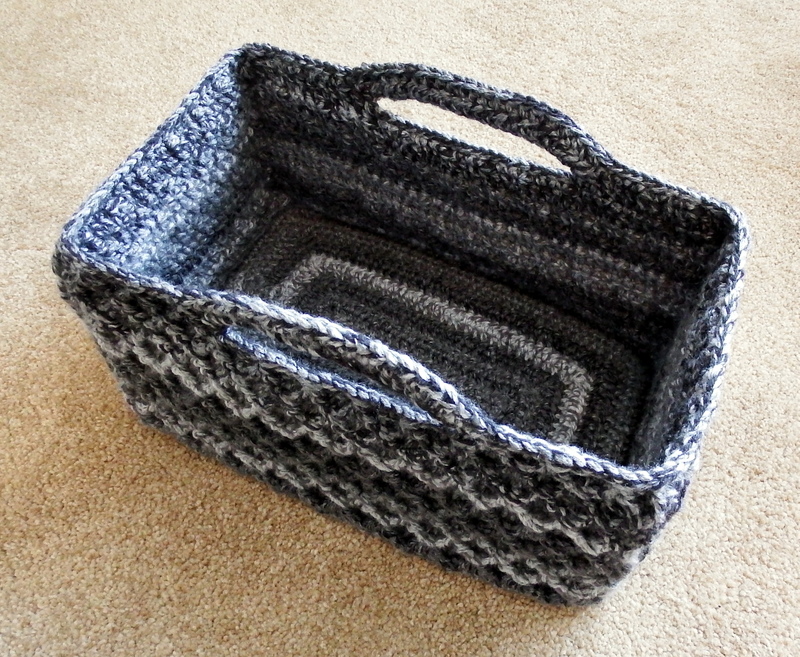 Finally I found an easy and pretty rectangular basket design with a crochet-around base instead of crochet and turn! Pretty!!! Thank you for describing the design and do it for free. Am I right to say that the base is crochet with a oval shape? How do you make the corners so defined? I’m glad you like this! Yes the base is crocheted in the round but should come out rectangular (or near enough). You can block the base before making the sides if you like. The sides use a post stitch down the corners to sharpen them up. My base started out rectangular then started rounding after the 4th or 5th row. The 2nd stitch out of the 3 hcd corner stitch becomes the new corner of the next round? Do you chain 2 every time? Hi jasmine! The 2nd stitch becomes the new corner as you say. If you are having curvy corner problems you can try blocking the base before you work the sides. Or you can alter the corners to fit your gauge requirements, but just make sure you end up with a multiple of 4 stitches per side before starting the sides! Do you ch 2 ever y time for the bae? Hi Danielle! Every round, yes. You can ch3 if you prefer. Your baskets looks great. I would like to make one for my family room to hold newspapers. Do you think it is strong enough to carry that much weight? Hi Brenda! It can certainly hold newspapers if they are flat, but I think if you’re after more of a magazine rack (upright) the basket would tip as it’s quite lightweight. I saw this on Pinterest originally. The pictures of this had been stolen and the Pinterest link only led to tiny copies of the same pictures. I voiced my disappointment and Esther was kind enough to give me the link to this website. I have previously purchased a pdf of the Pacific Rim Shawl on Ravelry.com I truly hope that the money went to Esther since I am a firm believer in intellectual property rights. I have sent you an email about my pacific rim shawl because this is a freely available pattern. I’m so sorry if you have paid someone else for it! Lets hope it turns out to be a similar design rather than plagiarism. I really appreciate you letting me know!